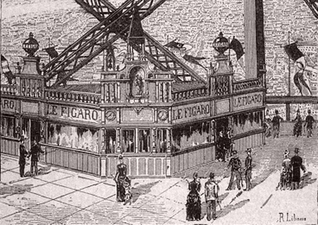 The pavilion of the newspaper "Le Figaro" is located on the 2nd floor of the Eiffel Tower, 115m high, it was designed to show the know-how of the newspaper to the visitors of the World Fair, in 1889. This pavilion was in wood, pinewood, and pitchpin, it came in the form of a two-part kiosk whose walls were glazed, so as to show the activity that took place there. In the first part were the offices where twelve journalists were working, plus some editors, a proofreader, a publisher and office boys. In the second there was a gas motor press and all the equipment necessary for the proper functioning of the equipment. This number was given to Mr. _________, in memory of his visit to the pavilion of Figaro, on the second platform of the Eiffel Tower, 115 meters 73 centimeters above the ground. The space left was used to put the name of the visitor who had thus a personalized newspaper, remembering his visit on the tower. He was also stamped, that is to say that the seller affixed a stamp certifying its authenticity. The interest of this pavilion was also to show the way the newspaper is made, at a time when it was not easy to find out about it. Here is the text that Gustave Eiffel wrote in his book 'The 300m tower', which summarizes everything you need to know about the tower. 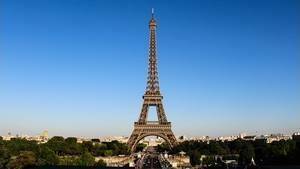 Eiffel, seen by its author. 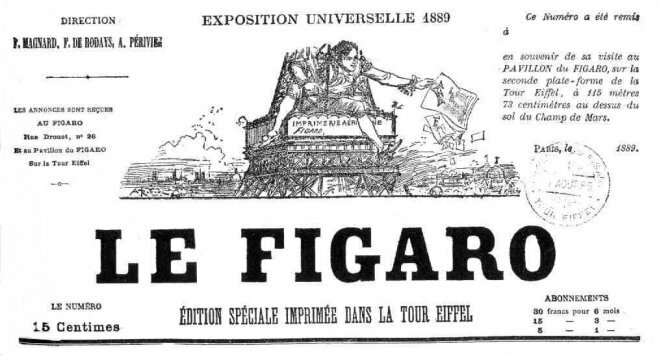 The newspaper Le Figaro had established on the second platform a pavilion near the Otis elevator of the North Stack, represented on the board XIX and whose external appearance is recalled by the figure below. 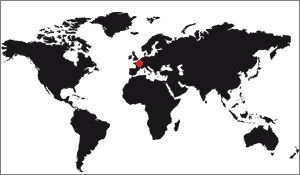 He set up a printing press with a Marinoni press for the publication of a special edition under the direction of M. Emile Berr. This daily newspaper, entirely written, composed and printed in this pavilion, under the eyes of the visitors, contained all the interesting facts of the Exhibition and mainly those relating to the Tower. The staff employed consisted of twenty-four employees. He appeared regularly from May 1st to October 1st. This pavilion received every day many visitors at the disposal of which was put a register to register their names and their impressions which were daily reproduced in each issue. At the time of the visit of the Shah of Persia, the Figaro de la Tour published a special issue composed half in Persian, half in French. Another very original number was the one that reproduced the posters of the Decauville railway, written in twenty-eight different languages.